The Missouri governor’s proclamation designating April 9-13 Stand-Up for Grain Engulfment Prevention Week. From left: Randall Gordon, president and CEO, National Grain and Feed Association; Anna Hui, director, Missouri Dept. of Labor and Industrial Relations; Loren Sweatt, deputy assistant secretary, OSHA. A kick-off event for Stand-Up for Grain Engulfment Prevention Week, was held April 9 at a Scoular Company grain facility in Adrian, Mo. The purpose of the campaign is to educate employers and workers about proper grain bin entry, mechanical hazards, and grain engulfment. OSHA Deputy Assistant Secretary Loren Sweatt explained that it only takes five seconds for flowing grain to engulf and trap a worker, and less than 60 seconds for someone to become submerged and in serious danger of death by suffocation. She encouraged all grain industry stakeholders to join this effort to reduce injuries and prevent fatalities from engulfment. 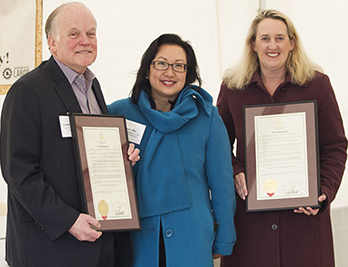 Anna Hui, director of the Missouri Department of Labor and Industrial Relations, presented a proclamation from the governor officially recognizing April 9-13 as Stand-Up for Grain Engulfment Prevention Week. Other speakers at the kick-off included representatives from the National Grain and Feed Association and the Grain Elevator and Processing Society, which are partners in this national outreach effort. A similar event was held the same day in Benton, Kan.
Visit the Stand-Up website for more information on the campaign. OSHA cited Luis Guallpa, a Massachusetts roofing contractor doing business as Guallpa Contracting Corp., for exposing workers to fall and other hazards at a Nashua, N.H., worksite. OSHA inspectors observed Guallpa’s employees working on a roof without fall protection, using ladders unsafely, and failing to use head protection. The agency cited the employer for exposing employees to these hazards, and failing to provide effective training. The company was cited for similar hazards in 2014 and 2015. OSHA proposed penalties of $299,324. Read the news release for more information. The U.S. Department of Labor and Lynnway Auto Auction, Inc., have reached a settlement agreement following a May 2017 incident in which five people were fatally struck by a sport utility vehicle during an auto auction. The Billerica, Mass., company agreed to designate and mark walkways and crosswalks, install barriers in the auction area, establish and enforce speed limits, evaluate employees’ driving capabilities and licenses, train employees, and review all vehicle collisions or near-misses. The company will also pay $200,000 in penalties. Read the news release for more information. OSHA has again cited Jose A. Serrato, an independent roofing contractor based in Marietta, Ga. — this time for exposing employees to fall hazards at a worksite in Birmingham, Ala., and for failing to re-train employees who did not demonstrate that they could recognize fall hazards. The employer, who has been cited seven times in the past five years, faces $133,604 in new penalties. OSHA conducted its latest investigation under the agency’s Regional Emphasis Program for Falls in Construction. For more information, read the news release. Omaha-based plumbing contractor Gavrooden Inc., was cited for the second time in less than six months for failing to protect its workers from excavation collapse hazards. OSHA inspectors observed employees working in an unprotected trench while repairing a sewer line. The company was cited in November 2017 for similar hazards at another worksite. Proposed penalties total $38,061. For more information, see the news release. OSHA cited Tower King II, Inc., for exposing employees to fall and struck-by hazards. Three employees were fatally injured while installing an antenna on a communications tower in Miami. OSHA found that the device that attaches to a tower to hoist loads failed, causing the employees to fall. OSHA proposed penalties of $12,934, the maximum allowed under law. For more information, read the news release. California OSHA issued four citations and $77,200 in penalties to California Premier Roofscapes in Escondido for exposing workers to fall hazards. Cal/OSHA inspectors determined that the company failed to: inspect a rope grab fall arrest before use; train workers on fall hazards; and provide required guardrail, safety net, or personal fall arrest systems. The company was cited six times in the past four years for exposing workers to fatal falls. For more information, see the news release. The Virginia Occupational Safety and Health (VOSH) Program issued four citations and $152,144 in penalties to Johnny Marenco Andasol and Darwin Marenco Andasol in Alexandria after a worker was electrocuted when an unguarded metal extension ladder made contact with a power line. VOSH inspectors concluded that the employers failed to adequately train workers using ladders about hazards from overhead power lines, and provide a ladder with nonconductive side rails. OSHA has ordered Jet Logistics, Inc., and Boston MedFlight to reinstate a pilot who was fired after complaining about workplace schedules that he reasonably believed were violations of Federal Aviation Administration regulations mandating pilot rest time. Reporting airline safety concerns is a protected activity under the Wendell H. Ford Aviation Investment and Reform Act for the 21st Century (AIR21). OSHA ordered the two employers to pay the pilot $133,616.09 in back wages and interest; $100,000 in compensatory damages; reasonable attorney fees; to not retaliate against the employee; and clear his personnel file. For details, read the news release. Last month, OSHA launched a four-month campaign in the Mid-Atlantic states to address the four leading causes of fatal injuries in construction. In March, the campaign focused on electrical hazards. 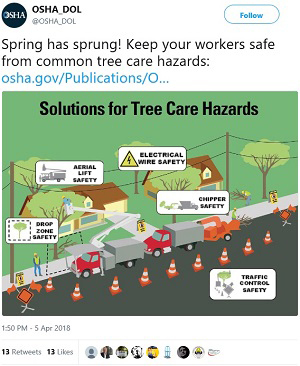 Throughout April, it will emphasize struck-by hazards with outreach events and toolbox talks on equipment, work zone driving, falling objects, securing loads, head protection, and examining a struck-by incident. Falls will be the focus next month and caught-in/-between hazards in June. The campaign partners include OSHA consultation projects, state occupational safety and health agencies in Maryland and Virginia, the Mid-Atlantic Construction Safety Council, and the General Builders and Contractors Association. For more information, contact OSHA Assistant Regional Administrator Nicholas DeJesse in Philadelphia. Balchem Corporation, an animal feed manufacturer, worked with the Utah Division of Occupational Safety and Health to improve the safety and health program at its Salt Lake City facility. Besides correcting all of the hazards identified by the state’s On-Site Consultation Program, Balchem implemented a staff committee to conduct regular safety audits and facility inspections. As a result, the Balchem facility has been a participant in OSHA’s Safety and Health Achievement Recognition Program for nearly ten years. For the past six years, it has maintained an annual recordable injury and illness case rate of zero, which reduced worker compensation insurance premiums. For more information, see Balchem’s success story. OSHA and Gilbane Residential Construction Company are working together to protect 200 workers during construction of a high-rise building in Buckhead, Ga. The three-year partnership will focus on preventing work-related fatalities, controlling or eliminating serious workplace hazards, and developing an effective safety and health program. OSHA and Holder-Austin-Moody-Bryson have joined to protect 1,200 workers during the construction of a parking garage and new roadway at the Atlanta International Airport. 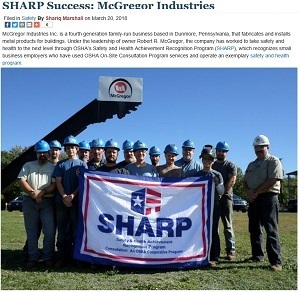 The three-year partnership aims to reduce employee injuries, illnesses, and exposures to health hazards; increase safety and health training; and ensure that employers have appropriate safety and health programs. The U.S. Forest Service – North Region signed a two-year agreement with OSHA to focus on safety and health issues in the forest industry, including facility and field hazard identification, and employee safety training. The OSHA Alliance Program fosters collaborative relationships with groups committed to worker safety and health. Alliance partners help OSHA reach targeted audiences, such as employers and workers in high-hazard industries, and give them better access to workplace safety and health tools and information. 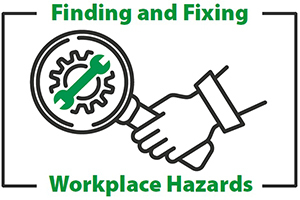 OSHA’s Hazard Identification Training Tool shows how to identify and prioritize hazards in manufacturing, construction, and healthcare settings. OSHA Training Institute Education Centers around the country offer a course on Health Hazard Awareness in the workplace. 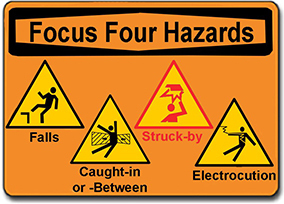 The National Safety Council provides a list of 7 Common Workplace Safety Hazards. Whether at the warehouse, dock, or construction site, drivers can be exposed to struck-by, crushed-between, and other safety hazards. 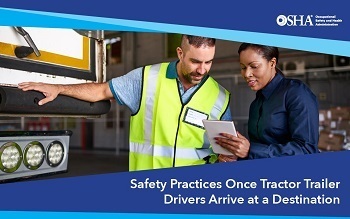 OSHA and the trucking industry developed a new flier that addresses the most common hazards for drivers after they reach their destination; parking, backing up, and coupling (attaching) and uncoupling (detaching) vehicles. Drivers need to be trained to safely couple and uncouple truck trailers from the rig, park vehicles on level ground, set the emergency brakes, and place wheel chocks between the tandem wheels of the trailer to prevent the vehicle from rolling.